The sensor matrix gives an overview of the entire sensor family. Make your choice based on housing variants and sensor compentents and click in the matrix. esp-4: Label and splice sensor compact in a single unit, optionally with M12 sensor heads. With a rapid pulse sequence, an ultrasonic transmitter beams upwards against the backing material. The effect of the sound pulses inducing the backing material to vibrate is for a markedly weakened sonic wave to be emitted on the opposite side. The receiver receives this sonic wave and analyses it. 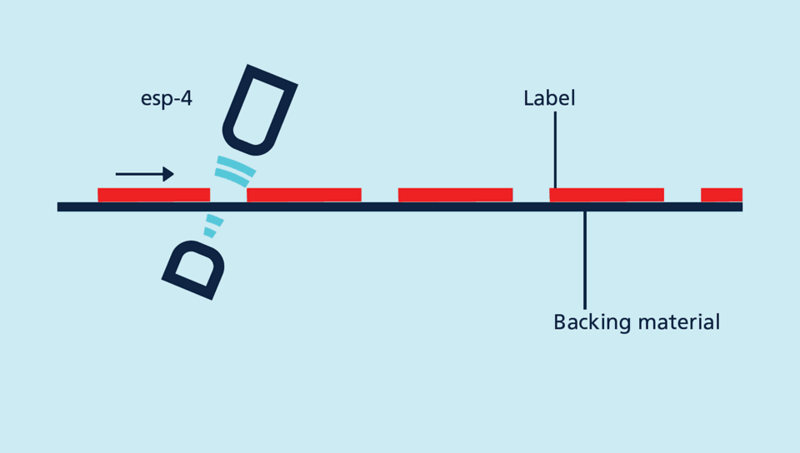 The backing material signal level is different to that of the label or splice. And this difference in signal is analysed by the esp-4. The difference between backing material and a label or between sheeting and splice can be very slight indeed. 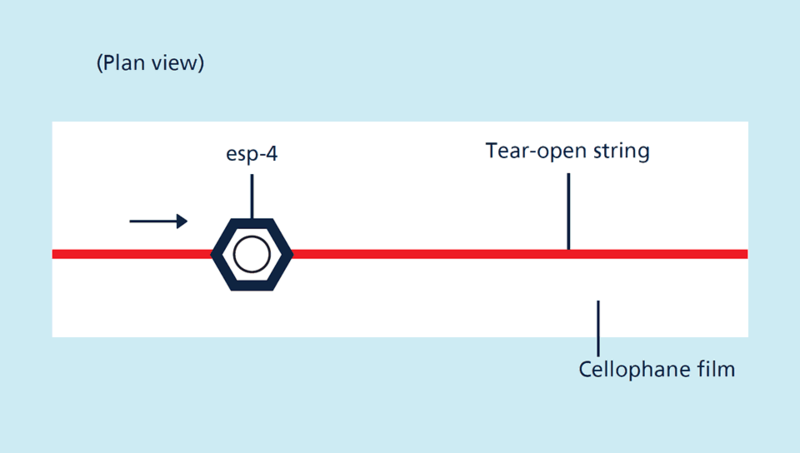 In order to differentiate, the esp-4 sensor has to learn the signal level for the backing material or sheeting. 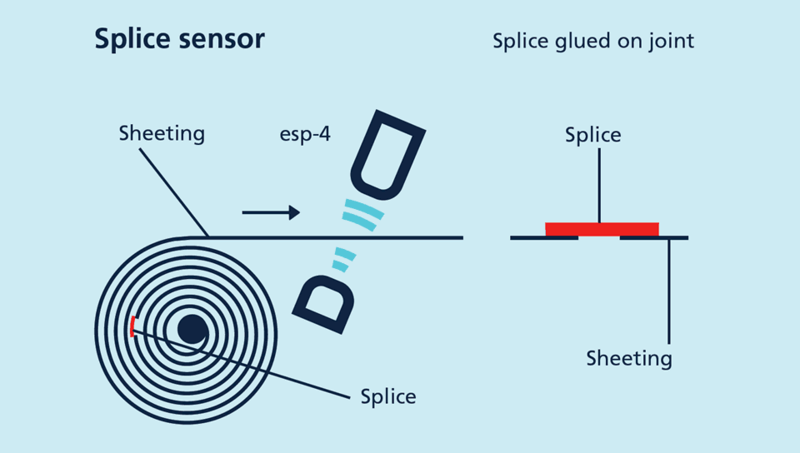 The esp-4 sensors can be used as a label and splice sensor. The 3 Teach-in methods permit the esp-4 sensor to be optimally set for each and every assignment. During Teach-in, the backing material with the labels is led at a constant speed through the esp-4 sensor. 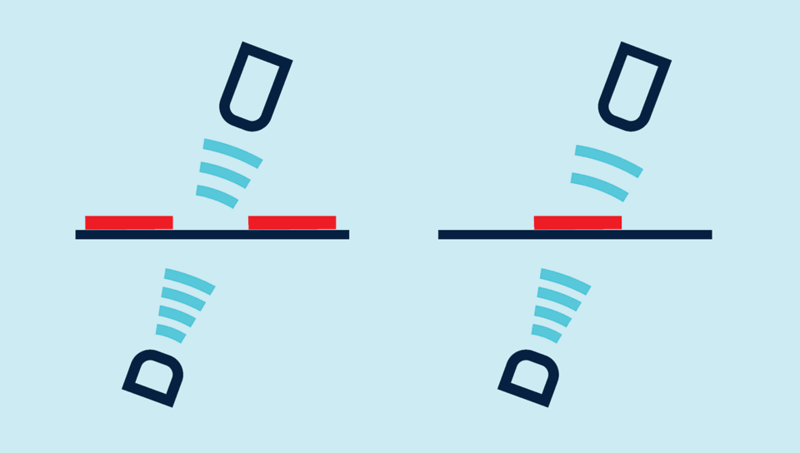 The esp-4 sensor automatically learns signal levels for the labels and for the gaps between them. This Teach-in method is also suitable for Teach-in of a tear-open string on a cellophane film. Here, during Teach-in, the tear-open string on the cellophane film is moved a number of times through the sensor. This enables the esp-4 to gauge the changing between cellophane film and tear-open string. Sheeting is usually processed from the roll. Then the splice to be detected for setting the esp-4 is somewhere inaccessible in this roll. A separate Teach-in method is available here in which the Teach-in only applies to the sheeting. The esp-4 detects the splice from this difference in sound level and sets its output. The esp-4/3CDD/M18 E+S as a receiving transducer integrated directly into the evaluation electronics is typically used for the detection of splices in thick sheetings. The esp-4/M12/3CDD/M18 E+S has an external receiving transducer. The transmitter and receiver are each housed in M12 threaded sleeves. The variant with M12 sensor heads is preferred for the detection of labels. the esp-4 can optionally be parameterised. Measured values can also be shown grafically.